Marc Newson is one of the most accomplished and influential designers of his generation. At 43, he has already worked across a wide range of disciplines to create everything from chairs, household objects, a bicycle and a concept car to restaurants, a recording studio and interiors of private and commercial jets, for clients based in Europe, North America, Asia and Australia. In 2004-5 Newson received the commission from Qantas Airways to design entire aircraft interiors for the new A380 fleet and new airport lounges for Sydney and Melbourne. He designed Talby, a mobile telephone for Japan's KDDI, the uniforms worn by the Australian Olympic team (in collaboration with Richard Allan), and worn at the 2004 Athens Olympic Games, a shoe, Zvezdochka, for Nike, collections of clothing for G-Star, and 'Scope' a range of luggage for Samsonite. He designed the bar and the sixth floor of the Hotel Puerta America in Madrid. In April 2005, Marc Newson was named as one of Time magazine's Top 100 most influential people in the world. In 2006, Marc was appointed Creative Director of Qantas Airways, and continued working on the A380 interiors and airport lounges. He designed the Marie-Hélène de Taillac (MHT) jewellery store in Tokyo and the Azzedine Alaia shoe boutique in Paris. He created a limited edition champagne magnum container for Dom Pérignon. He was awarded the Designer of the Year prize at Design/Miami. 2007 sees the opening of Marc Newson designed Qantas First Class lounges at Sydney and Melbourne airports and in June the unveiling of his spaceplane, designed for EADS Astrium, the fulfilment of a lifelong personal ambition. As well as winning numerous awards, including six Good Design Awards from the Chicago Atheneum, Newson has exhibited extensively. He created Bucky, a sculptural installation for the Fondation Cartier pour l'art contemporain in Paris in 1995, and a major retrospective of his work was held at the Powerhouse Museum in Sydney (August 2001 - February 2002). In 2003, Newson was commissioned by the Fondation Cartier to design a piece of his choosing, coinciding with his 40th birthday. The result was Kelvin40, a concept jet, exhibited at the Fondation Cartier in Paris (January - May 2004) and included in Marc's first major European retrospective originally staged at the Groninger Museum, Holland (May - September 2004) and consequently at London's Design Museum (October 2004 - January 2005). An exhibition of Marc Newson's new unique and limited edition pieces was shown at the Gagosian gallery, New York from January - March 2007. Newson's designs are present in most major permanent museum collections including the Museum of Modern Art in New York, London's Design Museum, Musée national d'Art moderne - Centre Georges Pompidou and the Vitra Design Museum. A book on Marc Newson's work was published by Booth-Clibborn Editions in 1999, and one by Thames & Hudson in 2001. A DVD was released in January 2005. Marc Newson is Adjunct Professor in Design at Sydney College of the Arts, and in the UK has been appointed 'Royal Designer for Industry'. Qantas was founded in Winton, Queensland on 16 November 1920 as Queensland and Northern Territory Aerial Services Limited by Paul McGuiness, Hudson Fysh, Fergus McMaster and Arthur Baird. Today Qantas Airways Limited is the national airline of Australia. The name was originally "QANTAS", an acronym for "Queensland and Northern Territory Aerial Services". The airline is based in Sydney, with its main hub at Sydney Airport. It is Australia's largest airline and is the world's second oldest airline. In 2009, Qantas was voted the sixth best airline in the world by research consultancy firm Skytrax, a slight drop from 2008 (third), 2007 (fifth), 2006 (second), and 2005 (second). Qantas flies to 16 domestic destinations and 21 international destinations in 14 countries across Africa, Americas, Asia, Europe and Oceania excluding the destinations served by its subsidiaries. The new Qantas A380 Qantas plane is for flights from Sydney and Melbourne to Los Angeles, Singapore and London, and has total of 450 seats. At 239 feet in length—seven feet longer than a 747 but with two full levels along its entire length—the A380 has, if not quite the space of a football field, more room on its two decks than in two tennis courts put together. Features: Touch screen suite controller controls seat / bed position, lighting, dual layer window shades and entertainment system. Bed is 83.5" x 29", and feature a 5 zone massage system. A sheepskin covered mattress is encased in a soft, pure cotton sheet. Adjustable privacy divider. High definition 17" screen monitor. Features: Self-service bar, choice of meals designed by Neil Perry's Rockpool Group, and seats offer extra width and recline, more legroom, a fully adjustable, in-arm, digital wide screen television monitor, as well as laptop power connection. Features: Fully-flat Skybed, in flight bar, advanced in flight entertainment, choice of meals designed by Neil Perry's Rockpool Group, noise cancellation headset. Seat covers get cleaned as needed and are usually done as a ship set during a 18 month interval 'C' check. The actual seat frame would get overhauled at a 'D' level check which is usually at 5 or 6 years depending on the program. I know at DL we do a cabin maintenance visit every two weeks. For a narrowbody this means 2-3 cabin mechanics(not AMTs) go through the cabin looking for broken stuff that has not been brought to our attention. This is seperate from cleaning. For cabin cleaning it is nightly vacuum and wipe down with a deep clean every couple of weeks. The deep clean is when they remove the seat cushions and blow all the peanuts and cherrios out of all the little crevises. You would be amazed at the pile they end up with. After looking at the condition people leave their seat areas in I conclude most people are slobs. As far as the actual frame goes, they're virtually maintenance free. Once in a while, a "SPECIAL SIZED PASSENGER" will break a seat frame, or a passenger will have a heart attack and shatter the seatback. In those cases, we simply replace a component if able, and if unable, we'll weld it back together, or install approved doublers inside the frame. The component which gets broken most often is the luggage bar.... the one at the bottom that keeps your luggage from sliding forward on landing. People step on it, and shear the rivets which hold it in place. This is a very simple repair. While seat functionality was a key goal, Qantas' brief to Marc Newson was to create a streamlined and contemporary aircraft seat. Throughout the design development process, Marc liaised closely with Qantas engineers and the seat manufacturer to ensure that all airline safety regulations were followed. Airline seats typically have a life cycle of approximately seven years, so the final design, including use of appropriate materials, had to be robust to accommodate thousands of Business Class customers over the expected life cycle of the seat. Most aircraft seats have a six to seven year life, so when the customer has had the seat for two to three years, we go to them with a recommendation of technological enhancements we have developed, which can now be applied to save weight and increase passenger enhancements, for example. By-products of being more proactive are that our spares sales have gone up, but more importantly, so has the level of satisfaction our customers are showing with both our product and service, which is leading to repeat business. While the industry standard for deep-cleaning a jetliner — a process similar to having your car professionally detailed — is roughly every 30 days, Delta had let its schedule lapse to every 15 to 18 months. That is akin to cutting your daily shower back to once every couple of weeks. Just months after Delta began installing new interiors, including pricey leather seats, Mr. Canavan and his staff were surprised to find that some of the planes were already filthy. Thus began a humbling airlinewide effort to become neater. Two cleaning contractors were fired for slipshod performance. Deep cleaning — an intense and precisely scripted process of brushing, scrubbing and vacuuming — now occurs at least every 30 days on Delta planes, bringing Delta up to par. A crew of auditors checks up on the cleaners. Passengers have the occasional unclean encounter on an airplane, but hygiene shortcomings may be most apparent to airline workers. JetBlue uses only leather seats, which show rather than conceal moisture. In part, that decision stems from a flight David Neeleman, JetBlue's chief executive, took before founding the carrier in 1999. C. J. Bostic, a flight attendant at Southwest Airlines for 35 years, has learned to spot trouble before it happens. "You have to keep a sharp eye if you see a lady going to the bathroom with a baby," she said. A diaper ditched in the lavatory trash will make its presence known three or four cities later. The crew tackles the lavatories and galleys, but the most tedious job is pulling the cushion off each seat and, while squatting or on hands and knees, brushing and wiping and scrubbing away the accumulated gunk. At row 26 in coach, an overhead bin holds an unfinished dinner in a takeout carton, including a pile of limp French fries. In the early 1990s, Airbus began to study the possibility of developing a jet with passenger capacity over 500 to directly compete with the Boeing 747. Engineering and design didn't begin until 1994, when the plane was known as the A3XX. Airbus considered a wide-body, twin-tailfin design but adopted a double-deck design instead. Eventually, the plane was designated A380, which does not keep the usual numeric sequence of other Airbus planes: The "8" was chosen because it reflects the cross-section of the plane's double-deck passenger area. In 2000, the first orders for A380s came in, and Airbus began laying the infrastructure for manufacturing the huge planes. This included massive hangars and factories in France, Wales, Germany, Spain and England. The A380 project had a staff of more than 6,000 people in 2002. While work was being done at the manufacturing end, sales were also picking up, with 14 airlines ordering 154 A380s as of early 2005. The first complete A380 was unveiled on January 18, 2005. Its maiden flight was on April 27, 2005. The first flight with a load of passengers occurred on September 5, 2006 and the second on March 19, 2007. Although Airbus initially announced that it would still be able to deliver the first plane to Singapore Airlines by the end of 2006, the company announced further delays following the first test flight and now project to deliver by October 2007. Airlines aren't ordering A380s just because it's big. The new design has to offer them a way to make more money, especially with the entire airline industry suffering from narrow profit margins. The A380 does offer opportunities for increased profit through the economics of scale. The operating cost of an A380 is not substantially greater than that of the Boeing 747 (the closest passenger jet in size and capacity). Every extra passenger on an A380 represents money made by the airline above and beyond what they could have made on a smaller plane. The increased range also helps add to an increased number of "seat-miles" per flight. The end result is a drop in per-passenger operating costs of 15 to 20 percent, according to Airbus. Other parts are made around the world, including some in the United States. Most of the largest parts are transported by barge. The tail assemblies are the only major part that can be transported by air (using the Airbus Beluga). A convoy of huge trucks carries the parts from Langon, France, to Toulouse. To accommodate such huge components, an entire infrastructure had to be created, including special river and seagoing vessels that allow parts to "roll on and roll off," customized port facilities and widened roads. Airbus was worried that pilots would need extensive training on such a large aircraft, increasing the effective cost to airlines. With that in mind, it refined fly-by-wire technology to decrease the pilot workload and placed the cockpit midway between the two passenger decks to keep visibility high and make sure everything felt familiar to pilots accustomed to flying other passenger jets. A camera mounted in the plane's belly allows the pilot to check the location of the wheels. The control systems are meant to be similar to other Airbus models, minimizing the amount of additional pilot training needed to fly the A380. The use of lightweight materials has helped to keep the weight down, while extensive wind-tunnel testing has resulted in the optimum aerodynamic shape for the A380. Special dampeners keep the noise level coming from the engines down to about half that of other jumbo jets. Carbon fiber, a strong, light but expensive material, is used on key parts of the A380. Roughly 25 percent of the plane's overall structure is made from carbon-fiber reinforced plastic (CFRP). To create the various shapes that comprise the A380, engineers use different processes. For large, flat pieces, a computer-controlled tape-laying machine processes resin-impregnated carbon-fiber tapes in a pressurized autoclave. For curved pieces, the CFRP fabric is shaped dry and then impregnated with resin. For some parts, large pieces of carbon-fiber were stitched together by computerized, industrial sewing machines. Newson admits that he is a control freak and describes how he thought long and hard about materials, finishes and functionality – criteria that airlines are not renowned for paying much attention to. Economy class is state-of-the-art and simple. Carbon fibre seats manufactured by Recaro, which makes seats for luxury auto brands such as Aston Martin, are very light and compact. Your chances of getting DVT are tripled from taking long haul flights, newspapers reported today. A study has found that women, especially those taking the contraceptive pill, and people who are particularly tall, short and overweight are most at risk. This research gives us a good estimate of how common venous thrombosis (DVT or pulmonary embolism) is after long haul flights. Although the study found that the relative risk of DVT is tripled, it also found that the absolute risk is still only one venous thrombosis for every 4,656 long haul flights. It also makes clear that using drugs to prevent venous thrombosis may not be beneficial for all travellers. One author of the study is reported as saying, "The results of our study do not justify the use of potentially dangerous [treatment] such as anticoagulant therapy for all long haul air travellers, since this may do more harm than good." Deep vein thrombosis commonly affects the leg veins (such as the femoral vein or the popliteal vein) or the deep veins of the pelvis. Occasionally the veins of the arm are affected (if spontaneous, this is known as Paget-Schrötter disease). A DVT can occur without symptoms, but in many cases the affected extremity will be painful, swollen, red, warm and the superficial veins may be engorged. The most serious complication of a DVT is that the clot could dislodge and travel to the lungs, which is called a pulmonary embolism (PE). DVT is a medical emergency, present in the lower extremity there is 3% chance of a PE killing the patient. A late complication of DVT is the post-phlebitic syndrome, which can manifest itself as edema, pain or discomfort and skin problems. A woman from Cardiff is calling for a fight to make air travel safer after her father died from so-called "economy class syndrome" following a flight to Australia. Thomas Lamb from Cardiff, was taken ill a day after flying with Singapore Airlines to Melbourne. The 68-year-old complained of breathing difficulties and was taken to hospital, where he went into a coma before dying five days later. Mr Lamb's daugher Linda Jones, 38, from Fairwater in Cardiff, said he was diagnosed with deep vein thrombosis in the lungs. Taking anticoagulants to prevent a blood clot that can develop after some types of surgery. They are also used in people who have a high risk of developing blood clots, such as those who have had previous clots. Using special stockings called compression stockings to help prevent deep vein thrombosis if you are at an increased risk. I have learned that DVT occurs when a blood clot forms in a large vein, usually in a leg. A potentially fatal PE happens if the blood clot breaks loose, migrates to the lungs and blocks a pulmonary artery or one of its branches. It has rightly been called a silent epidemic. DVT affects up to 2 million Americans per year and PE causes up to 200,000 U.S. deaths annually — more than AIDS and breast cancer combined. 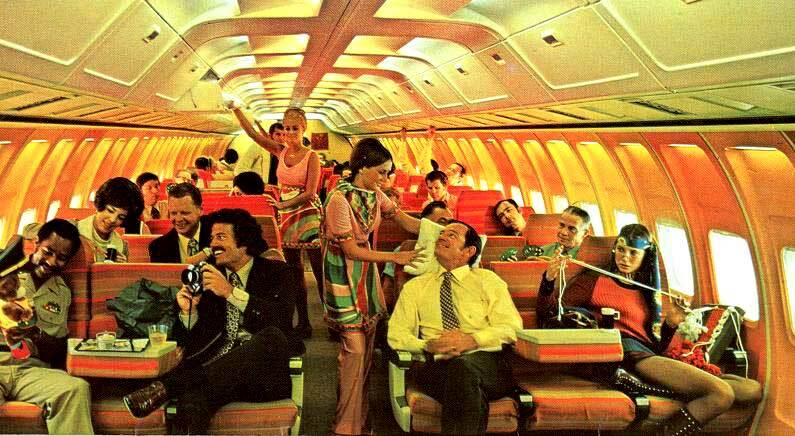 While some call it the "economy class syndrome," it in fact casts a far wider net. Among hospital patients, DVT and PE are the number one cause of unexpected death. Worse, two out of three such deaths could have been prevented, according to the American Public Health Association (APHA). Misunderstandings of the principles of aviation can fuel an unjustified fear of flying. For example, many people incorrectly believe that the engines of a jet airliner support it in the air, and from this false premise they also incorrectly reason that a failure of the engines will cause the aircraft to plummet to earth. In reality, all airliners can glide without engines, and the engines serve only to move the aircraft more quickly through the air and maintain its altitude over long distances. A big cause of fear of flying is that it's difficult to imagine how planes stay in the air, thus a person's understanding of the science behind flying can affect the person's fear about flying. Does Medication Work For Flight Anxiety? Not according to research at the Stanford University School of Medicine. When alprazolam, also knows as Xanax, was compared with a placebo, those who received the placebo did better. In fact, those taking alprazolam had ten times as many panic attacks when flying as those taking the placebo! Alprazolam is effective in controlling anxiety on the ground. Why not in the air? Alprazolam reduces anxiety by reducing awareness of inner conflict. It reduces inner conflict by reducing or shuting down "executive function". Boeing 377, Northwest Airlines, design by Walter Dorwin Teague, 1949. Lockheed Super Constellation, TWA Airlines, design by Henry Dreyfuss, 1954. Boeing 707-227, Braniff Airlines, design by Terry Labus and Henry Dreyfuss, 1954. 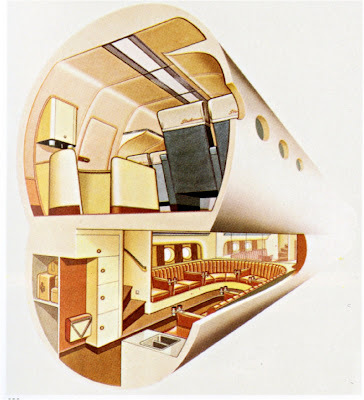 Convair 880, Northeast Airlines,first class lounge, design by Harley, 1959. 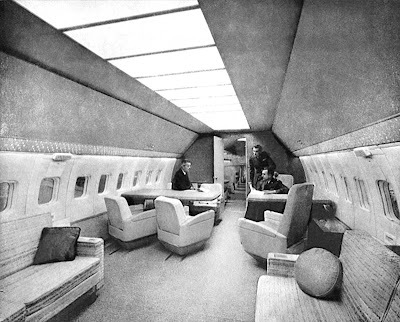 Air Force One, design Raymond Loewy, 1960. "Slimming down the cheap seats was one of innumerable design challenges Mr. Newson's team faced in its work on the Qantas A380, which is being prepared for its first flight next month, from a factory in Toulouse, France, to Sydney. It will begin regular commercial flights in October....'Our job is to look at everything in the cabin, all of the thousands of little details, most of which the passengers will never notice, and to make sure that they're intelligently designed," said Mr. Newson.' "
"Stephanie Watson, program director of the Australian International Design Awards, said the Qantas A380 seat won the Australian International Design Award of the Year for its innovative, functional and intelligent design. "Our judging panel were highly impressed with the revolutionary design of the Qantas A380 seat, the use of light - weight materials, the ergonomics and use of space, particularly in the seat recline and footrest," said Ms. Watson." Q: You say you spend a third of your time flying. What is the first thing you wanted to change or improve? "I flew Business class on Qantas new A380 from LAX to Melbourne. The aircraft was very impressive the bathroom was the size of a large dressing room that you can actually change your clothes without touching the walls, the storage for my carry-ons around my seating was much larger than the 747's and A330's and the reclinding pod seats folded flat with plenty of leg room. What a beautiful plane and I'll always choose this aircraft to fly if it's available." "Seats recline enough for comfortable sleep and are wide enough not to be troubled by your neighbour. Large size screens that are all armrest stored. Meal service is exceptional and better than many airlines business class." "Well worth it and saved me the money and I would recommend anyone wish for more legroom. Made getting in and out of the seat great and one needs to stretch the legs regularly on such a long flight." "I found that the A380 was an uncomfortable flight as when the person in front reclines you are left hardly any leg room, also found that the trays were smaller, the toilets smaller." The new rules, originating from the European Union, will help millions of travellers worldwide who are left "stranded" at airports because of delays, cancellations or overbooking. Although the regulations have been created by the EU, you won't have to live within the EU to benefit. Passengers travelling on all domestic and international flights taking off from any airport in the European Union, including French overseas territories, will be covered by the regulations. If you are travelling from an EU airport, all airlines - whether European or not - are subject to the rules. People flying into the European Union from overseas will also be covered by the new rules, as long as they are travelling on a European airline. In an attempt to discourage airlines from overbooking, passengers can now get roughly double the existing compensation if they are bumped off a flight. Compensation must be paid immediately. These passengers must also be offered the choice of a refund, a flight back to their original point of departure, or an alternative flight to continue their journey. When a flight is delayed, the airline may be obliged to supply meals and refreshments, along with accommodation if an overnight stay is required. Whether you qualify will depend on the length of the flight and the delay. For example, for flights of 1,500km or less where there is a delay of more than two hours, a passenger should be given meals and refreshments, along with two free telephone calls, e-mails, telexes or faxes. If the delay is for five hours or more, passengers are also entitled to a refund of their ticket with a free flight back to your initial point of departure if this is relevant. More than 1,000 passengers on nine different JetBlue flights were stranded on the tarmac for what must have seemed an eternity at John F. Kennedy International Airport in New York during Wednesday's snow storm. One flight, bound for Aruba, sat for nearly 11 hours, according to some reports. The air and toilets on the plane went foul, and the passengers, who well understood the impact of the snow, were given little or no information about why they couldn't just be set free in the terminal. Roll a stairway over? Bring a bus? Allow them to walk? No? Why not? Both legislators appear to be taking their cues from a group called the Coalition for an Airline Passengers' Bill of Rights, founded earlier this year by Kate Hanni of Napa Valley, Calif.
That flight sat on the runway in Austin for eight grueling hours, and as Joe Sharkey reported for The Times earlier this month, Ms. Hanni "spoke out to denounce the indifference that she said American Airlines showed toward her and her fellow passengers, and to demand a campaign for a federal bill of passenger rights." On New Year's weekend in 1999, a blizzard left thousands of passengers stranded for hours on Northwest Airlines planes at the airport in Detroit as food and water ran out and toilets became unusable. Kate Hanni, founder of the Coalition for an Airline Passengers' Bill of Rights, appeared on C-Span last week to discuss her appearance on Capitol Hill to lobby Congress for new legislation. * Publish and update monthly on the company's public web site a list of chronically delayed flights, meaning those flight delayed thirty minutes or more, at least forty percent of the time, during a single month. * Compensate "bumped" passengers or passengers delayed due to flight cancellations or postponements of over 12 hours by refund of 150% of ticket price. SeatGuru.com offers a comprehensive listing of seat and aircraft information for over 30 airlines. Simply click on an airline and a list of planes in service for that airline comes up. Take a look at your travel information and click the appropriate plane. A diagram then comes up with a listing of every seat. Notes include: Good seats, poor seats, seats to be aware of, as well as the locations of power ports, exit locations, galleys, lavatories, and closets. A list of in-flight amenities including audio, video, AC power ports are also shown. It's a plain and unfair fact of life. On long haul flights, while you're looking like something the cat dragged in with your messy hair, dried-up skin and bag-rimmed eyes, the flight attendants swanning around you are looking like something straight out of the pages of Allure. Keep reapplying your lipstick during the flight and use shimmer powder.